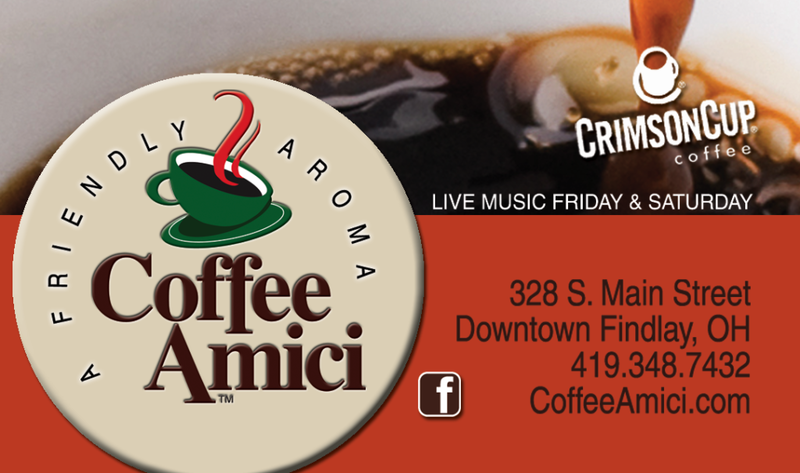 Coffee Amici proudly serves Crimson Cup coffees. After roasting, our coffee is packaged and shipped to Coffee Amici on the day it was roasted. Crimson Cup’s devotion to freshness ensures that you will get delicious coffee every time. Whether you drink at Coffee Amici or brew it at home, you’re assured of a consistently awesome cup of coffee or espresso. Exactly as we intended when we opened the doors of this Main Street, Findlay establishment in 2002. 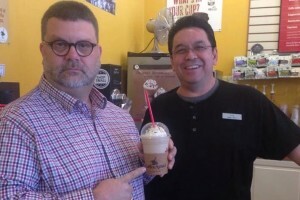 Coffee Amici is all you asked for in a coffee shop: A cozy hangout for savoring artisan-roasted coffee, espresso drinks, tea and frozen beverages made fresh by friendly, knowledgeable staff. Locally owned, locally operated. Of course, Findlay knows that we have a perpetual, rotating display of local visual artists featured on our walls. And our stage is frequented by local and traveling musicians and groups. The arts are very much part of our day-to-day operations. But it all comes down to the drink made from the organic, fair-trade, freshly-roasted coffee beans supplied to us from Crimson Cup. 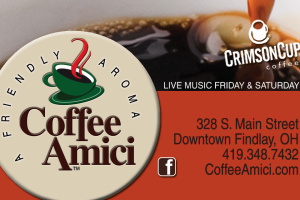 Coffee Amici is the premiere coffee house of Findlay, Ohio, serving espresso, cappuccino, lattes – hot, iced or frozen. Our signature drink is the Amici Mocha – a white chocolate and caramel latte topped with whipped cream and a caramel drizzle. Whenever Coffee Amici has a new customer that stares at our extensive drink menu until their head swims, we suggest this delicious, sweet drink – our very own, Amici Mocha. In addition to our drink menu boards we have dozens of customer favorites espresso drinks in a handy recipe book. Our coffee family can page through these pages of coffee drinks, lattes, cappuccinos, Americanos, teas, sodas, hot chocolates and mochas to find just the flavors to complement their day. Coffee Amici offers the finest flavored syrups, flavoring and toppings – and always have options for dietary restrictions. Coffee Amici features fresh baked goods from local bakeries – even some recipes custom created for our coffee shop alone. We love our relationships with other local businesses and our location in the heart of downtown Findlay – just a stone’s throw from our beautiful Hancock County Courthouse. Coffee Amici is a true hub in the city, offering a meeting place for 100s of gatherings each week. 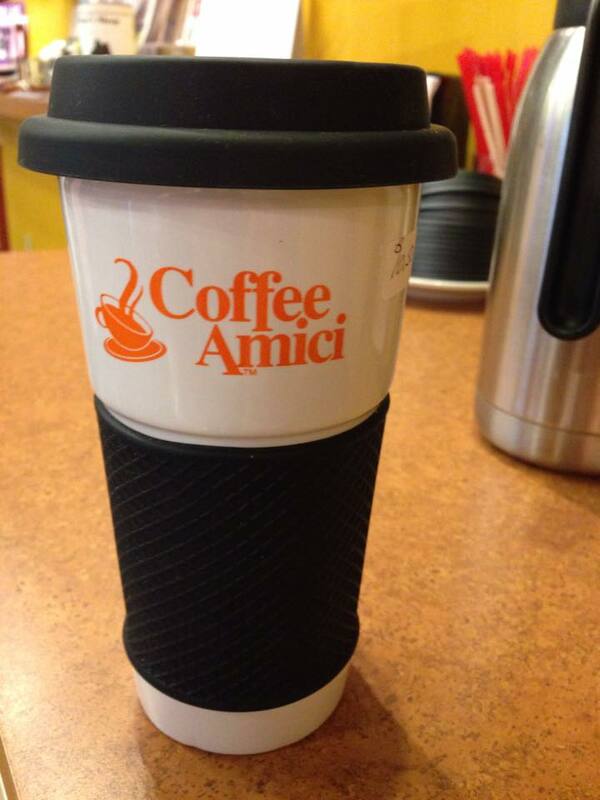 Come visit Coffee Amici! We will brew your espresso or coffee drink just the way you like it – delicious. 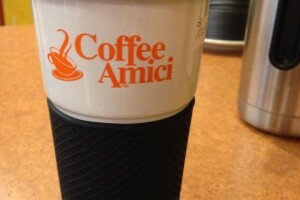 Love Coffee Amici! 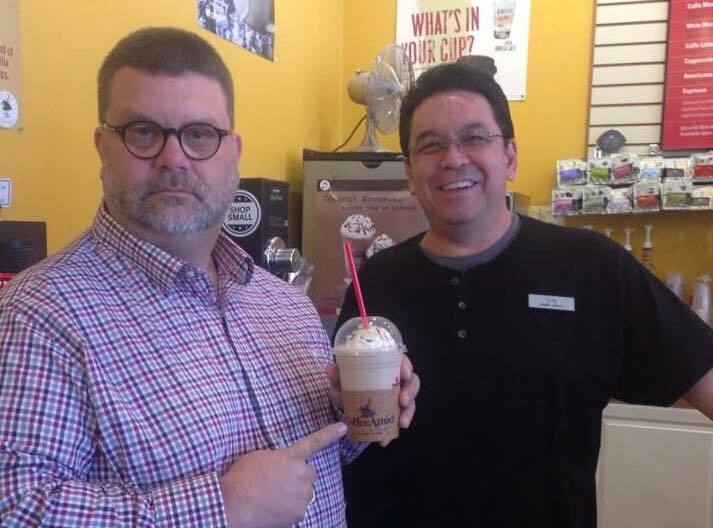 Friendly service and excellent coffee, tea, and smoothies!!! Great neighbors! And convincing customers to come to our office is so easy now that they get to stop for an Amici Mocha or espresso on their way back to see us!